Die EyeTV App verwandelt Ihr iPad oder iPhone in den ultimativen Fernseher! Mit EyeTV für iPad/iPhone greifen Sie per UMTS/3G oder Wi-Fi auf die EyeTV-Software beziehungsweise die EyeTV-Tuner-Hardware an Ihrem heimischen Mac zu. Im lokalen Wi-Fi-Netzwerk muss keine Konfiguration vorgenommen werden, aktivieren Sie in den Einstellungen von EyeTV einfach den iPhone/iPad-Zugriff. Außerhalb des lokalen Netzwerks ist die vollautomatische Konfiguration nicht in allen Fällen möglich, Details dazu finden Sie unter www.elgato.com/iphonehelp. EyeTV nutzt Port 2170. Wenn Sie die Firewall von Mac OS X einsetzen, stellen Sie sicher, dass Verbindungen von EyeTV und EyeConnect erlaubt sind. Können Sie dennoch keine Verbindung aufbauen, schalten Sie zum Test die Firewall aus. Funktion erfordert einen Mac (keine Unterstützung für PC). Die Verfügbarkeit der EyeTV App im App Store unterliegt der Freigabe durch Apple und kann nicht garantiert werden. "(the) iPad optimized version really takes the portable TV viewing experience to another level. I am very happy with EyeTV and recommend it with no reservations. "EyeTV made it incredibly simple to watch and record on my Mac, and to send that content to my iPhone when I'm not near the office." "Elgato’s name brings with it some expectations, and the app meets or exceeds nearly all of them. There’s no question about it, if you have EyeTV on your Mac, then you absolutely need EyeTV for your iPhone. Who needs a Slingbox?" People pay good money for a Slingbox, a piece of dedicated hardware that sits at home and lets you stream TV over the internet to a computer or smartphone. 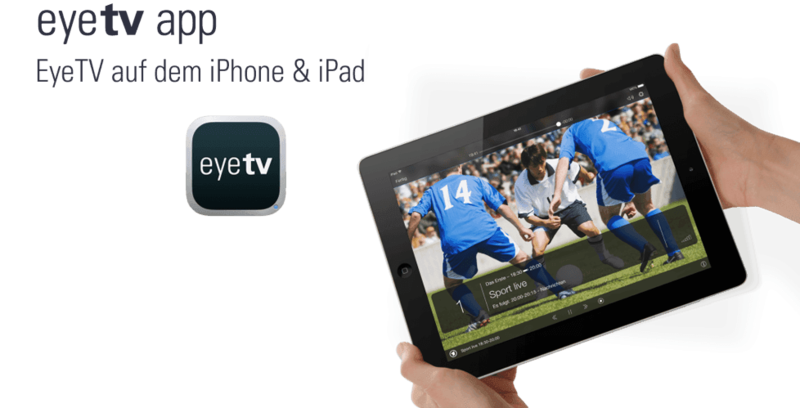 Now, you can use your Mac to do the same thing with the Elgato EyeTV iPhone app. The EyeTV App is a brilliant solution that has clearly been well thought out and designed. It isn’t just another remote control or remote player it is the perfect EyeTV companion. The ability to schedule recordings even when you are miles from your computer is an unexpected bonus to an already brilliant mobile application. In the “About” section of the mobile app Elgato have inserted the slogan “Turn your Mac into the coolest television in the house.” Well with EyeTV app you can now add the iPhone to that sentence, I love it. The look and feel of the iPhone app is first-rate, with white text on a black background, and with subtle color queues throughout. It's a joy to use... I'm delighted with the possibilities here. If I'm traveling, my iPhone will provide full access to my TV-on-Mac setup at home.